Africa is often depicted in the media as a continent of mass exodus. Images of desperate Africans on overcrowded boats bound for Europe, or those of stranded migrants in transit countries such as Libya, are plastered across our television and computer screens. The often sensational and one-dimensional reporting on African international migrants has played a role in invoking fears of the so-called ‘flood’ of migrants to Europe’s shores. These images, quite rightly, have drawn our collective attention to serious human rights abuses, as well as highlighting the dangerous situations that migrants can face when undertaking irregular migration. However, these images are increasingly at risk of being viewed as the norm. 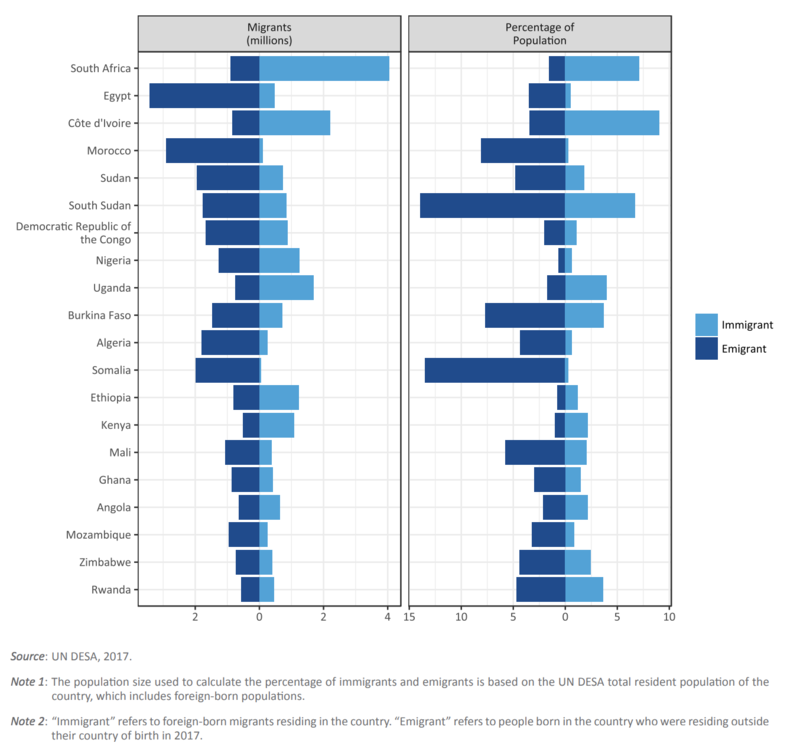 A more balanced examination of African migration is a pressing priority. The latest statistical estimates of international migrants produced by the UN can help. One of the most striking aspects about international migrants in Africa is that most move within the region. Contrary to much media coverage, the majority of Africans do not leave the continent. They largely move to neighbouring countries. Between 2015 and 2017, for example, the number of African international migrants living within the region jumped from 16 million to around 19 million. Within the same period, there was only a moderate increase in the number of Africans moving outside the continent, from around 16 million to 17 million. 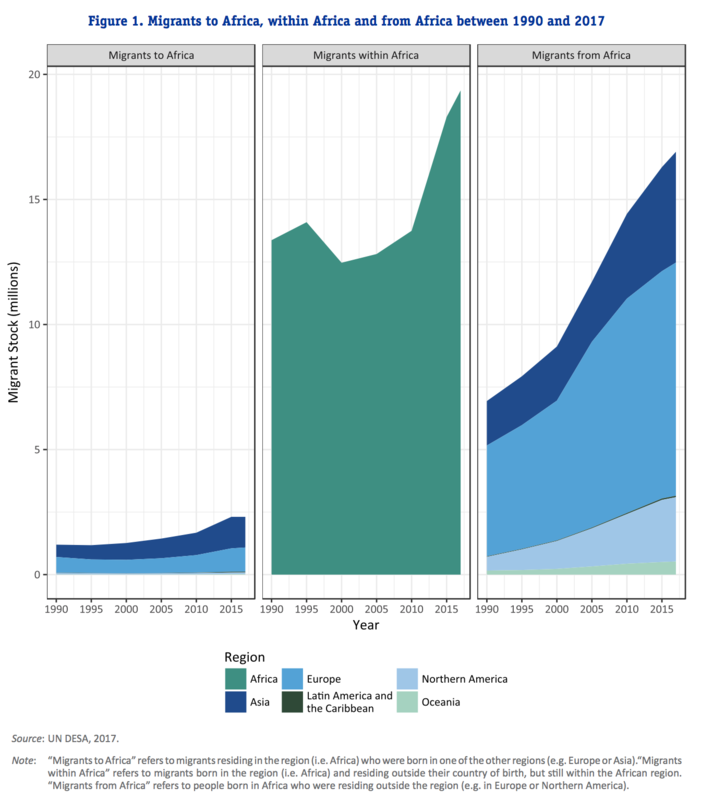 The number of African migrants who have left the continent is not negligible and has increased since 1990. However, intra-regional migration continues to outpace extra-regional migration. A number of key factors help to explain this phenomenon. Firstly, the surge in international migration within Africa is due, in part, to efforts by African states to enhance regional integration. Regional Economic Communities such as the Economic Community of West African States (ECOWAS) and the East African Community (EAC) have made the free movement of persons a key tenet of their drive towards greater integration. In addition to launching regional passports, both ECOWAS and EAC have in recent years abolished visa requirements for citizens of member states. ECOWAS has gone even further, by abolishing residence permits for its citizens. In March 2018, the African Union adopted a continent-wide protocol on free movement, which, if signed and brought into force by all member states, will significantly enhance intra-regional migration. But the influence of free mobility is just part of the story. For many people in Africa, moving to a country within the region is the only viable option. The prospect of relocating to countries such as those in Europe or Northern America is often quickly tempered by the reality of gruelling, cumbersome and highly restrictive visa requirements. Unlike citizens of more developed regions, many Africans, by virtue of the passports they carry, have limited options in terms of the number of countries they can access. 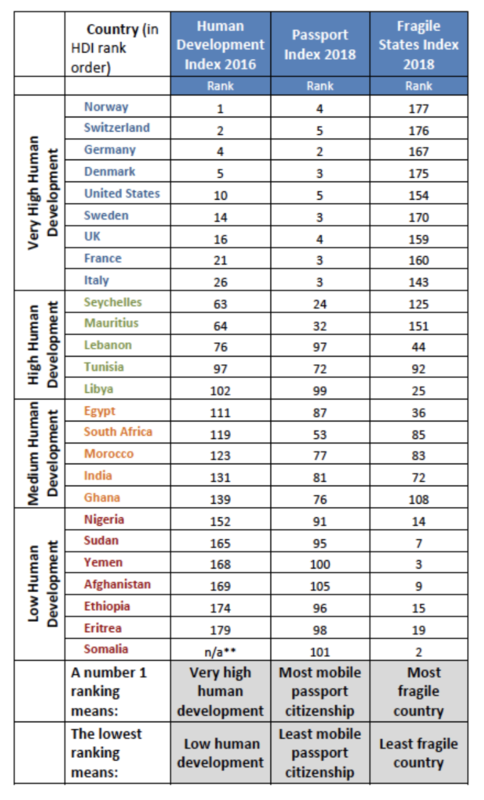 The table below summarizes global indices of human development, fragility and visa access of selected countries. According to the 2018 Henley and Partners Passport Index, which ranks passports by the number of countries their holders can access without a visa, only three African countries – Seychelles, Mauritius and South Africa – are among the world’s 100 most mobile passports. The ability of people to access countries visa-free broadly reflects their country’s development status, as well as how fragile, stable, safe and prosperous it is in relation to other countries. The reality is that travel and migration for people from developing countries and more fragile states is much more difficult. This is also in the context of significant displacement in the region, which includes large refugee populations. In this context, free mobility arrangements within Africa are particularly important for migrants. A country such as South Africa, for example, with one of the most sophisticated economies in the region, is often the alternative for many people on the continent, providing opportunities but also placing pressure on effective migration management. As the figure below illustrates, South Africa was home to around four million international migrants in 2017, the most in the region. With one of the fastest growing populations in the world, and as more African countries continue to review and revise entry requirements for the region’s citizens, the number of international migrants in Africa shows no sign of slowing. With intra-regional migration enabling talent, labour and entrepreneurial youth to remain in the region, future policymakers may well be asking how to attract migrants from Africa.